The cups you make with biscuit dough wrapped around a cylinder of some kind and toasted to golden perfection over a campfire go by a lot of names. 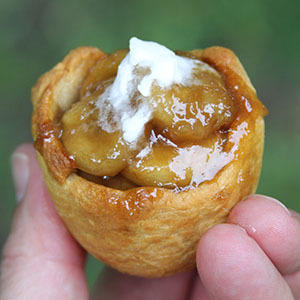 Campfire biscuit cups are also called Wolf ‘em cups, Woof ‘em cups, Tarts on a Stick, Cobbler cups, and more … all based on the brand name of the implements used to make them. Kids may just call them a lot of fun and many parents find them a good way to get the kids involved in camp cooking and crafts. 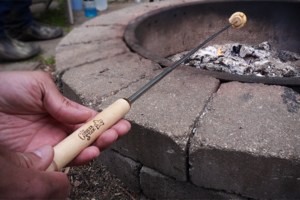 With a variety of both sweet and savory filling options available, anyone in the camping crew is likely to consider them delicious. 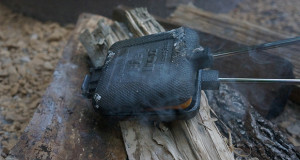 If you shop Amazon, your local big box, or a hardware store, you can find a variety of the sticks available, but they generally Cobbler Stick 1 copycome down to two designs – either a 1 ¼ inch wooden dowel 2-3 inches long on the end of a roasting stick or an inverted metal cup on the end of a roasting stick. We tried biscuit dough and crescent roll dough. Because of the round shape, the biscuit dough worked better, especially on the metal cups shaped like small flower pots. Crescent roll dough was ok on the cylindrical dowels, but require more forming and fussing to get it to seal. We tried both Grand and Junior size biscuit dough. Overall, the Juniors worked better. The technique that worked best with the least tearing of holes in the dough was to take the round piece of dough for one biscuit and put it down on a semi-non-stick surface like a porcelain plate. Thenwith your finger tips, gently pat the dough into a larger circle. About 3-3½ inches across is about right. Hold the form pointing up on the stick, and drop the dough centered over the top of it. Then press it onto the form to even up the length of the cup sides all the way around. We never had any problems with sticking whether we oiled the form (wood or metal) or not. (There’s enough oil in the dough it seems to prevent sticking.) Especially on the metal forms, the oil prevented the dough from holding the shape while baking, and it made it hard to form a good cup. A light spritz of cooking spray worked well on the dowel form models. The models with metal forms shaped like upside down flowerpots, created larger biscuit cups, which made it easier to spoon in fillings. The cups baked on the dowel forms were smaller and the opening was pretty small when the dough puffed up. A common problem was the outside of the cup being done, and the inside being raw. To compensate, we baked the cup until the outside looked perfect, then carefully removed the cup from the form. Then we placed the cup, open side down, on the grate above the fire for a few minutes until it was finished baking. Perfection. 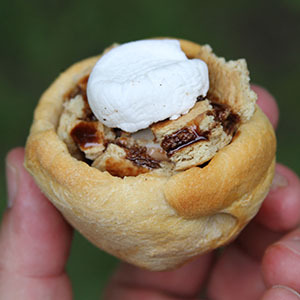 Experimenting with both sweet and savory fillings for campfire biscuit cups was a blast. We recommend you make a whole variety ahead of time, and let your campers choose what they want from a “fillings bar” on the picnic table. One “universal” must-have is a can of spray whipped cream. It’s a great topping on nearly any sweet option and on more than one occasion has been used as a filling on its own! 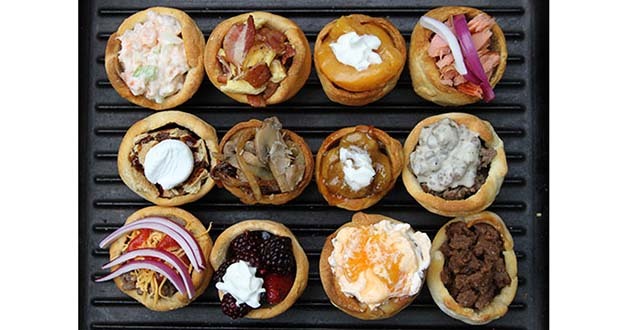 All of these campfire biscuit cup fillings have just a few ingredients, and can be whipped up quickly at any moderately well-equipped campsite … or at home ahead of time. 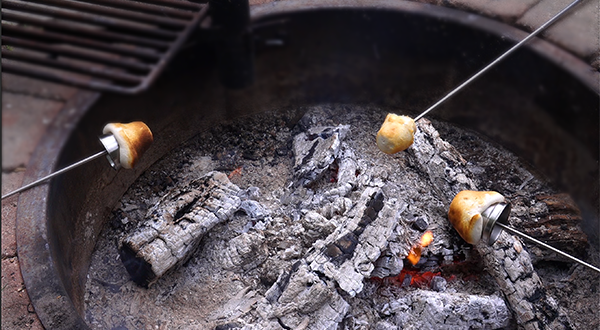 Set them up as a buffet on the picnic table along with some biscuit dough and half a dozen roasting sticks and your site will undoubtedly be the most popular in the campground. Blend all ingredients thoroughly in bowl. A quick and easy savory breakfast filling ... no toast required. Fry bacon in skillet until crisp and set aside. Reserve bacon drippings. While bacon is frying, beat eggs in separate bowl with splash of milk. When bacon is removed, pour beaten eggs into skillet and scramble to preferred doneness. 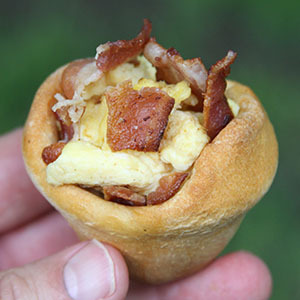 Spoon eggs into biscuit cup and put bacon pieces on top. A sweet summertime favorite. 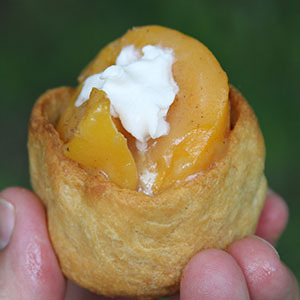 This recipe uses canned peaches, but if you hit a farmer's market and fresh peaches are in season, it's even better! Add flour and stir continuously for about two minutes. Add brown sugar and stir until completely melted into butter. Simmer until juice is simmering and thickening. Stir frequently. Remove from heat and spoon into biscuit cups. Top with whipped cream. It doesn't get simpler than this savory delight. Bring the smoked salmon and the red onion, and you don't do any cooking except the cup over the campfire. Pull apart salmon filet with a fork. Slice onion thinly or dice, whichever you prefer. 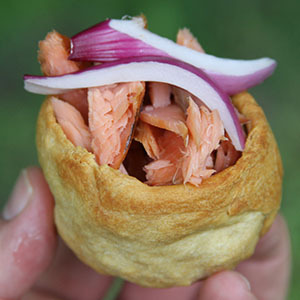 Place pulled salmon in cup. 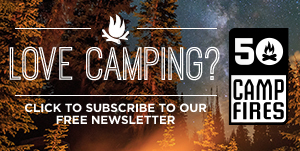 A sweet new riff on a classic campfire favorite. Break or crush graham crackers as you prefer. Cut marshmallows in half if you’re using large ones. Layer marshmallows, pieces of cracker, and chocolate sauce in biscuit cup. Top with marshmallow and drizzle more chocolate if desired. 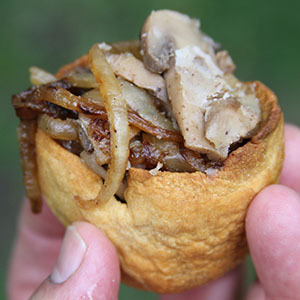 Savory caramelized onions and sauteed mushrooms. What could be better? Melt half butter in skillet. Sautee onions until nicely browned. Set aside. Melt remaining butter in skillet. When they are almost done, add onions back to warm. Mix well, and spoon warm mixture into biscuit cups. 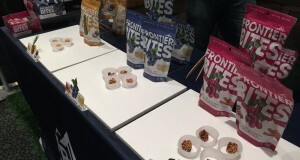 This sweet dessert filling was one of our favorites in the whole taste test. While it’s melting, peel and slice banana. Add brown sugar to melted butter and stir to melt. When melted and well-mixed, add banana, cinnamon, and rum (if used). Stir until bananas are completely covered in the sauce. 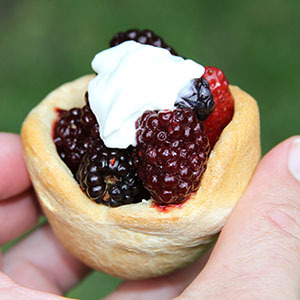 Spoon into biscuit cups and top with whipped cream to taste. Another savory breakfast classic, but this is so good it goes great any time! Brown sausage thoroughly. Set aside ½-3/4 and keep warm. Using your favorite recipe, mix up a batch of country gravy. 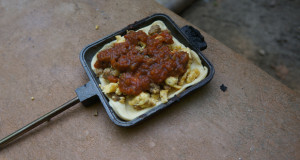 Spoon warm sausage into biscuit cup. Cover with gravy – as much or as little as you like. 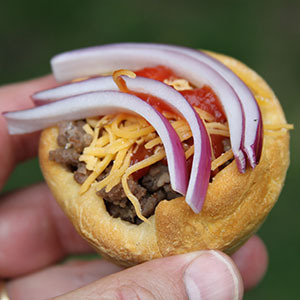 America's classic savory comfort food -- in a campfire biscuit cup. Brown hamburger thoroughly in skillet. Use steel spatula to chop it finely as it fries. When at desired doneness, set aside and cover with foil to keep warm and moist. 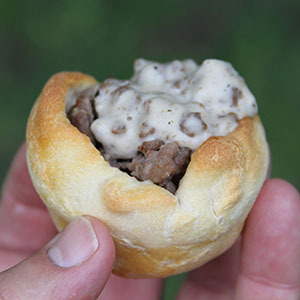 Spoon burger into biscuit cup. Top with cheese, onion, and ketchup to taste. Return the biscuit to skillet over fire to warm and melt cheese. Tent with foil if desired. This classic sweet filling requires virtually no prep. Thaw and open mixed frozen berries. Then spray on as much whipped cream as you can handle. Pour mostly thawed mixed berries from bag into bowl. 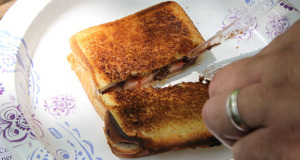 Layer as generously with Reddiwip as suits your taste. 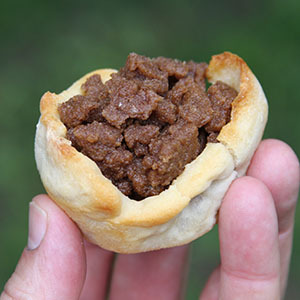 This sweet filling requires the most "making" of any here, but is well worth the effort and the wait. It's the perfect texture for a filling with the bonus of the orange slices. Heat one cup water to boiling. Add boiling water to gelatin mix in large bowl, and stir until completely dissolved. Add one cup cold water and three ice cubes. Stir and set aside to cool for five minutes. Stir in instant pudding mix for about two minutes, and set aside to thicken for about 15 minutes. 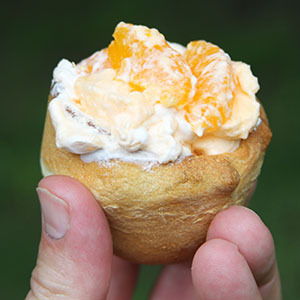 Gently stir in drained mandarin oranges and Cool Whip just until well incorporated. Put in the refrigerator for 30 minutes or freeze. 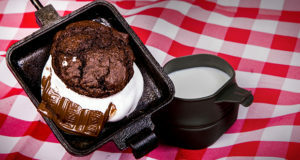 Scoop mixture into cooled campfire biscuit cups. Be sure to dig to the bottom of the bowl to get oranges as they may have settled there. If you like sweet candied nuts, you'll love these cups. It's the candy without the nuts. Add brown sugar and stir continuously until sugar is melted, dissolved, and bubbling. Add cinnamon and continue to simmer for one minute. 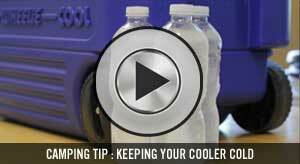 Pour and scrape liquid sauce into a separate container and allow to cool. When ready to use, slightly warm the mixture to soften it. Stir to incorporate everything, but leave semi-solid. 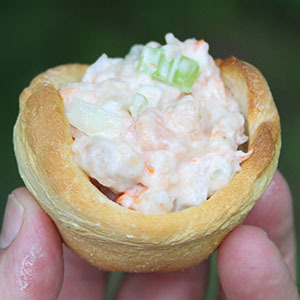 Spoon chunks into warm campfire biscuit cup. 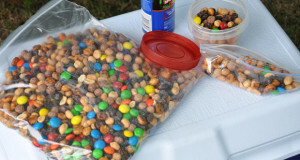 Easy Camping Trail Mix – Happy Trails!